A delicious Kerala style Chicken Curry made with boneless chicken, onions, tomatoes, coconut oil and grated coconut masala. Serve with rice or roti. 2. Add the star anise, cardamoms, ginger, curry leaves, cloves and pepper powder. 3. Stir well and fry for a minute or two. 4. Add the grated coconut and fry for a minute. 5. Remove, cool and grind. 7. Add the chicken, onions and saunf. 8. Stir well and cook for 3 to 4 minutes. 9. Add the ground masala, ginger garlic paste, salt and tomatoes. 10. Simmer for 20 to 30 minutes or until the gravy starts to thicken. 11. In a small frying pan, fry curry leaves in little oil and pour over the curry. 11. Remove and serve with roti or pulao. 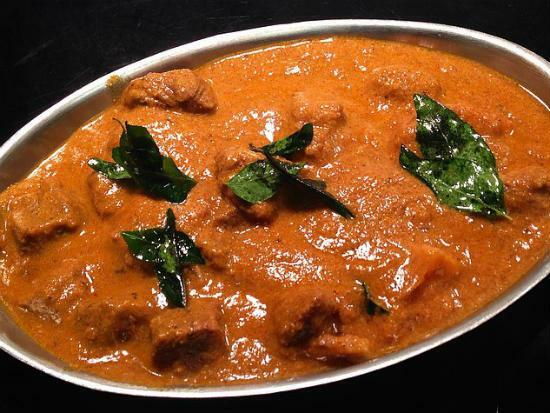 Feel free to comment or share your thoughts on this Malabar Chicken Curry Recipe from Awesome Cuisine.